Carolina Rebellion is returning for another year, and it’s not that far away! The festival has just announced set times for its 2013 edition, which is the third year it has been held. 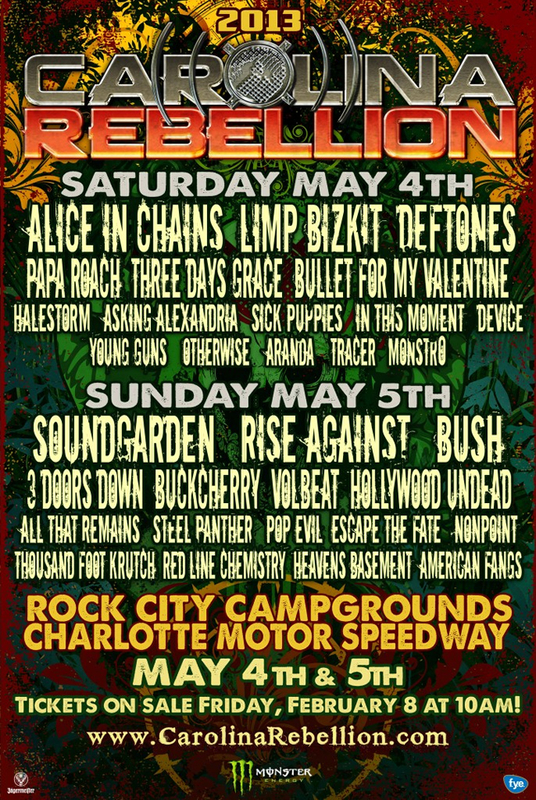 Carolina Rebellion takes place May 4 & 5 at Rock City Campgrounds at Charlotte Motor Speedway in Concord, North Carolina, just outside of Charlotte. There are five days left to get your tickets at the current price, and you can grab them from the official website here. Full set times as well as additional info is listed below. Note: All who have purchased a Camping Upgrade, Camping Package, Hotel Package or Friday Night Campground Party upgrade are invited to attend. Weekend General Admission tickets for Carolina Rebellion are available for only $119 plus fees, and Single Day tickets are now $69.50 plus fees. General admission parking is included with each paid ticket. A limited number of Camping, Hotel and VIP Packages and upgrades are also still available. Details for all Camping, Hotel and VIP packages can be found at www.CarolinaRebellion.com. 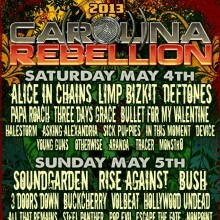 The Carolina Rebellion Campgrounds open on Friday, May 3 at noon and close at noon on Monday, May 6. General admission, ADA, VIP and motorcycle parking lots will open at 7:00 AM on Saturday, May 4 and at 8:00 AM on Sunday, May 5. Festival doors open at 9:00 AM on Saturday and 10:00 AM on Sunday. For full event details, go to www.carolinarebellion.com/info. Carolina Rebellion is proud to be sponsored by Monster Energy, Jägermeister, U.S. Army and f.y.e. Carolina Rebellion is produced by Right Arm Entertainment and AEG Live, the same team that produces the highly successful Rock On The Range in Columbus, OH. Rock City Campgrounds at Charlotte Motor Speedway is located at 7301 Bruton Smith Blvd. in Concord, NC, just outside Charlotte, and less than two hours from Raleigh/Durham, Columbia and Greensboro. Visit www.CharlotteMotorSpeedway.com for directions and additional venue information.